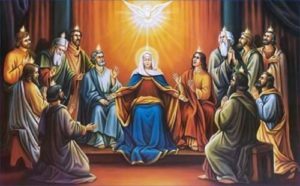 DAY 16 (September 23) MARY, QUEEN OF APOSTLES – Welcome to Fr. JohnBosco's Blog! 33 DAYS PREPARATORY PRAYER FOR THE RE-CONSECRATION OF NIGERIA TO THE IMMACULATE HEART OF MARY. V. In the name of the Father, and of the Son, and of the Holy Spirit. Amen. V. Come Holy Spirit, fill the hearts of the faithful. Let us pray: Oh God, who by the light of the Holy Spirit, did instruct the hearts of the faithful, grant that by the same Holy Spirit we may be truly wise and ever rejoice in his consolation, through Chris our Lord. Amen. HYMN TO THE BLESSED VIRGIN MARY. O come to the heart most pure! In whom salvation is sure. O Lady of Fatima, hail! Thou hope of the human race! The future, all it may be. God our father, you gave the Holy Spirit to your Apostles as they joined in prayer with Mary, the Mother of Jesus. By the help of prayers, keep us faithful in your service and let our words and actions be so inspired as to bring glory to your name. We ask this through Jesus Christ our Lord. Amen. While they were with him, they asked, “Lord, are you going to restore the rule of Israel now?” His answer was: “The exact time it is not yours to know. The Father has reserved that to himself. You will receive power when the Holy Spirit comes on you; then you are to be my witnesses in Jerusalem, throughout Judea and Samaria, yes, even to the ends of the earth.” No sooner had he said this than he was lifted up before their eyes in a cloud which took him from their sight. They were still gazing up into heaven when two men dressed in white stood beside them. “Men of Galilee, they said, why do you stand looking up the skies? This Jesus, who has been taken from you will return just as you saw him go up into the heavens.” After that, they returned to Jerusalem from the mount called Olivet near Jerusalem, a mere Sabbath’s journey away. Entering the city, they went to the upstairs room where they were staying: Peter and John and James and Andrew, Philip and Thomas, Bartholomew and Matthew, James son of Alphaeus, Simon the Zealot party member, and Judas son of James. Together, they devoted themselves to constant prayer. There were some women in their company, and Mary the mother of Jesus and his brothers. Remember that miracle at the foot of the Cross where Jesus handed over his mother to the beloved disciple! Obviously, she was not meant for him alone. That beloved disciple was a representation of many others as we shall discover in coming days. Today, we just discovered the first beneficiaries of that special gift of his Mother – the apostles. The above reading tells us that while they were in the upper room after the ascension of Jesus, she stayed with them, probably providing them with her maternal care. Her presence with the apostles earned that title. In their booklet, “Devotion to Mary, Queen of Apostles,” the Daughters of St. Paul express, beautifully, the meaning of this title: “Mary is Queen of Apostles because she was chosen to be the Mother of Jesus Christ and to give Him to the world; she was made the Apostles’ Mother and our own by our Saviour on the cross; she was with the Apostles while awaiting the descent of the Holy Spirit, obtaining for them the abundance of supernatural graces they received on Pentecost.” She is still playing that role for us today. Do trust her and carry on. With her by our side, we shall emerge victorious in all endeavours. Lord God, we thank you for the gift of our country Nigeria. You made it a fertile ground for the work of missionaries, guided by the power of the Holy Spirit. Your Word is now firmly established in our land such that we have not only become missionaries to ourselves but also to other nations. As your Son Jesus Christ reposed in the arms of the Blessed Virgin Mary, so have we reposed Nigeria in her arms by making her our Patron Saint. As a nation, we are going through turbulent moments, with hunger, pain, killing, kidnapping and many other atrocities being committed against each other. We believe that never was it known that anyone who fled to her protection, implored her help or sought her intercession was left unaided. And so we come before her again, sinful and sorrowful, and desiring to re-consecrate Nigeria to her Immaculate Heart. May she intercede on our behalf to stabilize our ship of state. We present ourselves as a nation, renouncing our past faults and offences. We resolve to imitate the exemplary life of our Mother Mary. Help us to renew and rectify the vows of our Baptism; rejecting Satan and all his works and empty promises. Obtain for us the grace for a perfect consecration of our nation to the Immaculate Heart of Mary. We seek her continual intercession and maternal protection. May this this re-consecration bring forth peace, unity and tranquility to the nation and foster communion and service so as to radiate the joy of the Gospel for the common good of our country. Our Lady Queen of Nigeria, Pray for us. Lord God, we pray that your people may persevere in obedience to your will and in the service of mankind, and so advance towards their salvation. We ask this through Christ our Lord. Amen.